First, we agree that global warming is for real. For me, the clearest and most irrefutable evidence is the rapidly diminishing extent of the artic polar icecap each summer. There is much evidence that cause of global warming is the use of fossil fuels, coal, oil and gas, which releases carbon dioxide into the atmosphere. Secondly, even though the problem is worldwide, and China emits more CO2 than the U.S., nevertheless the U.S. has a responsibility to provide the leadership of which only it is capable. The problem is, as the LA Times article makes very clear, our disorganized and inefficient response to the problem. Separate and haphazard responses by individual states are not nearly enough, rather we need a coherent national response. A national carbon tax of perhaps $20 per ton of CO2 emitted would provide a uniform market mechanism to encourage the reduction of carbon emissions from fossil fuels or their replacement by alternate sources of energy. Coal power plants, for example, would not be forced to shut down but would have to figure out how to emit less carbon in order to remain economically viable. This would be a big improvement over our current situation! 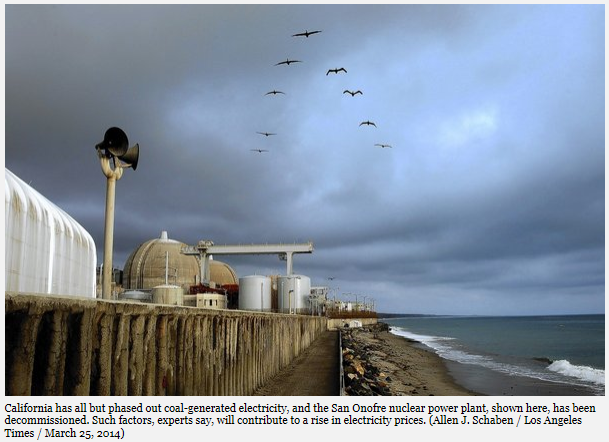 This entry was posted in carbon tax, coal, global warming, Los Angeles Times, nuclear energy and tagged Global warming by jackheidel. Bookmark the permalink.